Melatonin is a hormone made by the pineal gland — the unassuming, pea-sized gland located in the middle of your brain. Melatonin, nicknamed the sleep hormone, has a key role in promoting a person’s healthy sleep cycle. More melatonin is produced in the evening hours, when sleep is typically desired, as opposed to daytime hours. Over a person’s lifetime, production of this hormone declines (x). In 1959, scientists discovered the important task of melatonin within the body. Since then, it has been highly popular as a supplement for sleep issues. 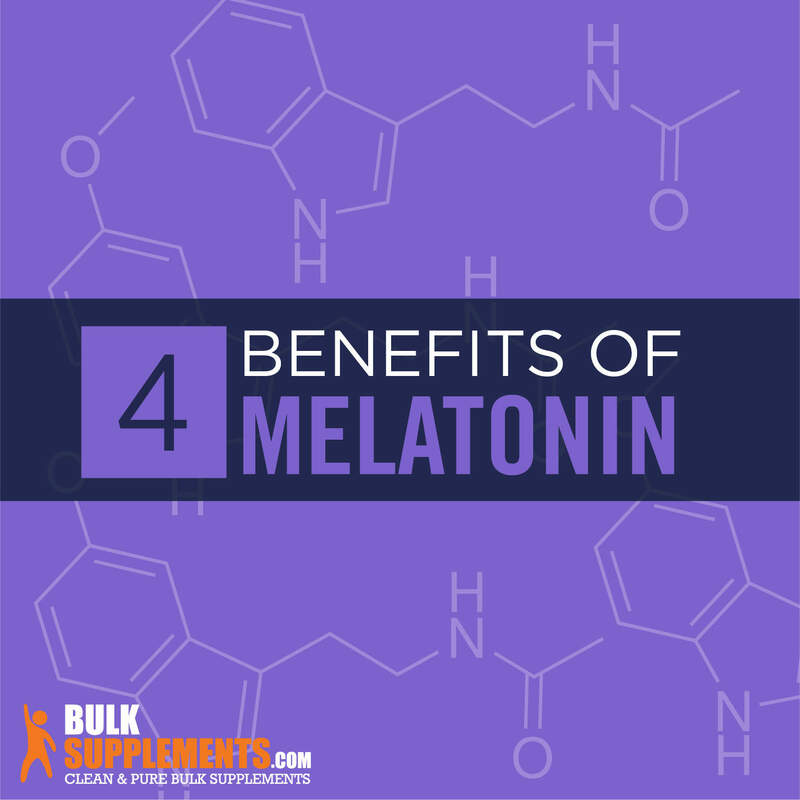 But besides benefiting sleep, melatonin has antioxidant and anti-inflammation properties. It is also connected with body temperature, blood pressure and the immune system. Researchers are examining this fascinating, natural hormone to determine if it can help other issues as well. Conditions such as Alzheimer’s disease, cancer, ALS, nocturnal high blood pressure, narcolepsy and autism spectrum disorder all may benefit from melatonin as research continues (x). The pineal gland in the brain makes most of the body’s melatonin, which is also a natural byproduct of the amino acid tryptophan. Once produced, it travels within the bloodstream and spinal fluid, sending messages all over the body. Special receptors can detect melatonin, which is ten times more abundant at night than during daytime hours (x). Tryptophan, an important amino acid, is abundant in foods that contain protein. It’s also present in the body, where it makes proteins and produces important chemicals (neurotransmitters) that transmit signals to the brain and other parts of the body. Tryptophan converts into 5-HTP, which then makes melatonin and serotonin. Both of these influence sleep. 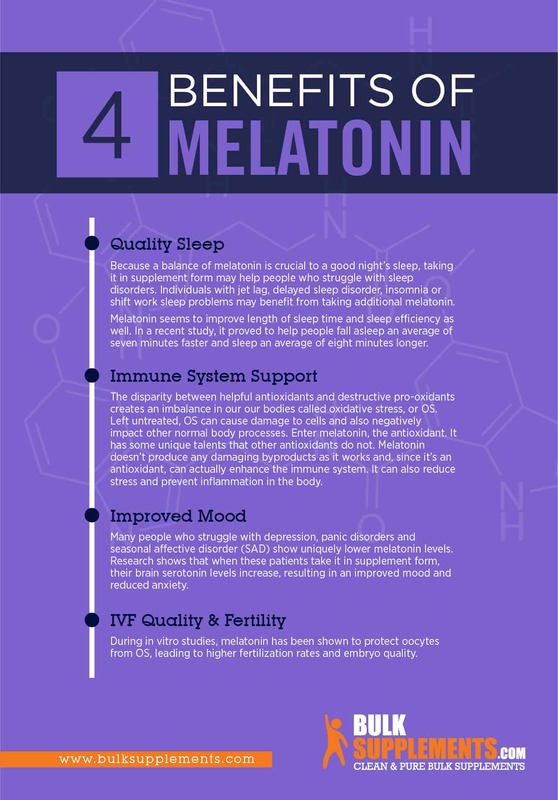 Melatonin is most focused on the sleep-wake cycle. Using mobile devices at night can also change melatonin levels, since it only takes a dim light to affect production. Researchers are studying the effects of these on the production of melatonin, as well as the effects of a disrupted sleep cycle (x). Besides the circadian rhythm affecting melatonin levels, there’s also a seasonal rhythm connected with its production. In seasons with less light, levels typically increase. For animals and birds, this regulates seasonal body changes, such as reproduction and changes in fur and feathers to suit the seasons. In humans, melatonin’s effects seem less obvious, but scientists think the seasonal changes affect other circadian rhythms within the body (x). Because a balance of melatonin is crucial to a good night’s sleep, taking it in supplement form may help people who struggle with sleep disorders. Individuals with jet lag, delayed sleep disorder, insomnia or shift work sleep problems may benefit from taking additional melatonin. Melatonin seems to improve length of sleep time and sleep efficiency as well. In a recent study, it proved to help people fall asleep an average of seven minutes faster and sleep an average of eight minutes longer (x). Insomnia is a relatively common concern, and it’s also a side effect of other illnesses. People who supplement with melatonin for insomnia need to take an appropriate dosage, but the timing is just as important. It reaches its maximum concentration and effectiveness around thirty minutes (x). Narcolepsy is a neurological disorder of a person’s circadian sleep cycle. People with this condition typically fall asleep involuntarily when relaxed. In several studies, scientists have used doses of melatonin to boost normal sleep patterns in patients with narcolepsy (x). Some children who have various medical conditions also struggle with sleep problems. Researchers are studying children with cerebral palsy, epilepsy and autism spectrum disorders to determine if melatonin can assist the length and quality of their sleep. However, long-term safety and side effects in children have not been verified (x). Blindness often causes disrupted sleep patterns, because there is limited perception of light. This causes a disruption in the normal process of melatonin production. A study was conducted with 49 blind individuals who did not have any conscious perception of light. They were given supplements with positive results in sleep patterns (x). The disparity between helpful antioxidants and destructive pro-oxidants creates an imbalance in our our bodies called oxidative stress, or OS (x). Left untreated, OS can cause damage to cells and also negatively impact other normal body processes. Enter melatonin, the antioxidant. It has some unique talents that other antioxidants do not. Melatonin doesn’t produce any damaging byproducts as it works and, since it’s an antioxidant, can actually enhance the immune system. It can also reduce stress and prevent inflammation in the body (x). Many people who struggle with depression, panic disorders and seasonal affective disorder (SAD) show uniquely lower melatonin levels. Research shows that when these patients take it in supplement form, their brain serotonin levels increase, resulting in an improved mood and reduced anxiety (x). During in vitro studies, melatonin has been shown to protect oocytes from OS, leading to higher fertilization rates and embryo quality (x). Alzheimer’s is a degenerative condition. Symptoms of dementia get worse as the disease progresses, going from mild memory loss to increased loss of communication or memory. Melatonin may be able to improve cognitive impairments connected with Alzheimer’s disease (x). ALS is a degenerative, progressive disease that affects the brain’s nerve cells and spinal cord. Melatonin is being studied as a help to patients suffering from ALS. It may also prevent cell damage (x). Melatonin may reduce elevated blood pressure during sleep (x). In one study, consistent and repeated melatonin use reduced systolic and diastolic blood pressure at night. The treatment did not affect the heart rate, and results weren’t as effective in a single, unrepeated dose. Cancer patients treated with melatonin, in addition to chemotherapy, may have improved treatment success rates (x). Recently, research showed that the hormone melatonin is reducing the side effects of chemotherapy (x). Since tryptophan is part of the body’s melatonin production line, adding tryptophan to your diet can be helpful, too. Foods rich in tryptophan include poultry, dairy products, seafood and legumes. Melatonin supplements are available in pills, liquids and chewables. These are derived from natural or synthetic sources. Some people take 2 mg of melatonin to help them fall asleep. It is best to take it 30-60 minutes before bedtime. It is possible to reduce the side effects of jet lag by taking .5-5 mg on the first few days after flying. Shift workers can take 1.8 mg of melatonin 30 minutes before bedtime in order to increase sleep quality. Melatonin is a natural element made by the body, but it’s best to take as low a dose as possible that is still effective. 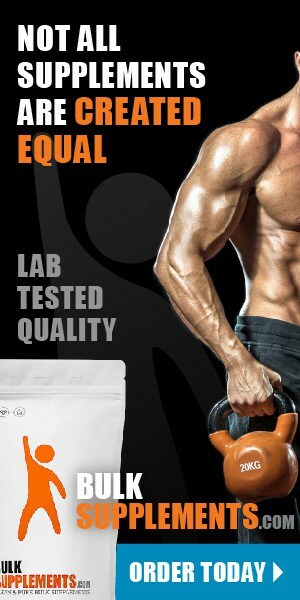 As with any supplement, follow directions on the product and ask your health provider before proceeding. Women who are pregnant or breastfeeding should ask their health practitioner before taking melatonin. The side effects of melatonin may include drowsiness, headache, dizziness, vivid dreams and a temporary reduction in alertness and balance. People with bleeding disorders should not take melatonin, since it may increase the risk of bleeding (x). It may also influence normal hormone production in some individuals and impact blood sugar and insulin levels. Melatonin may interact with drugs and supplements (x) such as high blood pressure medication, corticosteroids, antidepressant medication and Benzodiazepines, to name a few. It’s best to see a professional if you or a family member is having sleep issues. Timing of dose for melatonin supplements is important because it may affect the body’s biological clock. FDA regulates supplements like melatonin, but these regulations are less strict than the guidelines for prescription drugs. There have been no reports of notable side effects in children. Tell your health provider about the supplements you may be taking. Melatonin is the unseen, naturally produced hormone that seems to be responsible for a good night’s sleep. Manufactured by the pineal gland and dispersed by the body, levels rise and fall depending on the actions of the optic nerve, the body’s master clock, light sources and the seasons. Melatonin production normally follows a cycle of light and darkness, dancing to the body’s circadian rhythm of sleep and wakefulness. Aging, disease and sleep disturbances can indicate a need for more melatonin, and researchers are continuing to experiment with it in supplemental form. Thankfully, there are numerous ways to get a proper amount of melatonin when you need it. However you get it, though, it will be working hard so you can get some sleep.